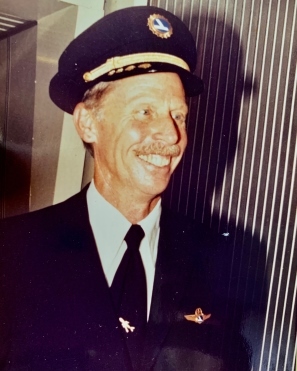 Captain Frank Allan Causey Jr., a long-time resident of Miami Springs and later of East Ridge Retirement Village, passed away from complications of pneumonia in Miami on Feb 7, 2019. Although Frank had a stunning intellect in addition to many talents and hobbies, it was his friendliness and incessant desire to be useful, to help others, that always stood out. He was devoted to his family and a kind, helpful neighbor and friend. Frank was born Dec 28, 1931 in Clara, Miss., the oldest boy of six siblings. His family moved to Jackson, Miss. where he lived until he graduated high school and the Korean War started. Thanks to a call from an uncle, an officer in the U.S. Navy, Frank enlisted and began what was to be an illustrious career in aviation. He worked as a machinist, line mechanic and then flight engineer on PB1W and WV2 aircraft much of the time flying airborne early warning barrier patrol in the Atlantic from Thule, Greenland south. In 1956 he took a job as a flight engineer at Eastern Airlines where he remained for 35 years. He worked in many capacities at Eastern from flight engineer to captain & from the training department to chief pilot and VP of flight operations. What he always truly loved to do, however, was fly. Frank met his love, Phyllis Hardy, a former Eastern flight attendant, and her two daughters while working at Eastern Airlines. They married in 1970 and had one daughter together. Phyllis passed away in 2015 after 45 years of marriage. Together they had many friends and loved to play golf and travel. In his last chapter of life, Frank was a devoted father and grandfather and fully embraced his life at East Ridge. He was a helpful neighbor and friend, loved to dress up for events and was close with many employees. Frank is survived by his three daughters, Kathy Kern, Susan Kern and Carrie Foote (Thaddeus), four granddaughters, his siblings, Jo Ann Dukes (Carl), Mary McCune Skinner and William Causey, and many beloved nieces, nephews and cousins. A celebration of Frank’s life will be held at East Ridge on March 2nd at 1pm. In Lieu of flowers, please consider a donation in Frank’s honor to the Honor Flight South Florida organization.